Previously, I have written about mercury and some other metals being used as drugs throughout the eighteenth century, and we have also seen that most physicians were well aware of the potential danger of metals to the human body. Some of them even actively warned against metals in their academic work. This week, I found a treatise by the Leiden professor of chemistry H.D. Gaub (1705-1780), which appeared in the transactions of the Dutch Science Society in 1754, on testing wine for lead. Lead poisoning was quite common in the early modern period, as lead was used in eating and cooking utensils, in water containers and in alcohol distillation equipment. Moreover, lead was sometimes deliberately added to wine to make it sweeter. This caused fast and severe, often lethal lead poisoning, that was also known as Poitou colic (after a particularly widespread case of lead poisoning by wine in the French city of Poitou in the 1720s) or painter’s colic – painters were prone to lead poisoning because of the high levels of lead in many paints. By the mid-eighteenth century, it was commonly known that adding lead to wine was a dangerous practice, and as Gaub wrote, governments in wine-producing countries had set heavy penalties on it. However, his own tests revealed that even some of the Rhine and Moselle wines commonly drunk in the Netherlands contained lead anyhow. For a while, it was thought that lead could be detected in wine by mixing spiritus salis (hydrochloric acid) through it. But Gaub did his own tests and came to different conclusions. It turned out that only lead dissolved in vinegar became visible as a white powder or turbidity when spiritus salis was added. Other forms of lead in wine, such as sugar of lead (lead acetate), lead white, minium (red lead), and lead oxide remained undetected. The only reliable way to test wine for the presence of any form of lead, Gaub argued, was the already known method of using Atramentum Symphateticum, a tincture of arsenic sulphur and quicklime. In order to test wine for lead, a little wine was poured into a white cup and some drops of the Atramentum Symphateticum were added. If the wine went cloudy with a yellowish-red, brown or black colour, lead was present – the darker the colour the higher the lead contents. If the turbidity was whitish, there was no lead in it and it was safe to drink. Gaub finished his treatise with some words of comfort. 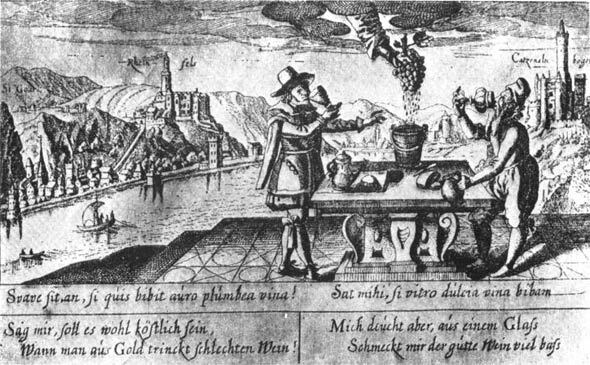 Although lead pollution did occur in Rhine and Moselle wines, it was not very common because of the laws and regulations in the German lands. Wine lovers should be wary of extremely sweet wines, as well as those that were uncharacteristically dark for their age, and wines of supposed high quality offered at a very low price. In case of doubt, they could rely on the Atramentum Symphateticum test, which, by the way, also worked for butter, which in times of scarcity was apparently also sweetened with lead. This little treatise shows that an academic physician and chemist like Gaub also applied his knowledge for very practical purposes, and wanted to spread it for the common good. Moreover, it shows the historic realm of seemingly contemporary issues such as food safety and the relevance of science for society. Think about that, next time you have a glass of wine or put some butter on your bread! Gaubius, H.D. “Over de Loodstoffen. Aanwysing Van een Middel waar door men het Schadelyk mengsel van Loodstoffen in de Wynenmet genoegsaame zekerheid kan ontdekken.” Verhandelingen uitgegeeven door de Hollandsche maatschappye der weetenschappen te Haarlem 1 (1754): 112–126. Also see Eisinger, J. “Early Consumer Protection Legislation: a 17th Century Law Prohibiting Lead Adulteration of Wines”. Interdisciplinary Science Reviews 16, nr. 1 (maart 1991): 61–68. A gemstone for every ailment?